Young galaxies blaze with bright new stars forming at a rapid rate, but star formation eventually shuts down as a galaxy evolves. A new study, published January 1, 2018, in Nature, shows that the mass of the black hole in the center of the galaxy determines how soon this "quenching" of star formation occurs. Every massive galaxy has a central supermassive black hole, more than a million times more massive than the sun, revealing its presence through its gravitational effects on the galaxy's stars and sometimes powering the energetic radiation from an active galactic nucleus (AGN). The energy pouring into a galaxy from an active galactic nucleus is thought to turn off star formation by heating and dispelling the gas that would otherwise condense into stars as it cooled. This idea has been around for decades, and astrophysicists have found that simulations of galaxy evolution must incorporate feedback from the black hole in order to reproduce the observed properties of galaxies. But observational evidence of a connection between supermassive black holes and star formation has been lacking, until now. "We've been dialing in the feedback to make the simulations work out, without really knowing how it happens," said Jean Brodie, professor of astronomy and astrophysics at UC Santa Cruz and a coauthor of the paper. "This is the first direct observational evidence where we can see the effect of the black hole on the star formation history of the galaxy." The new results reveal a continuous interplay between black hole activity and star formation throughout a galaxy's life, affecting every generation of stars formed as the galaxy evolves. Led by first author Ignacio Martín-Navarro, a postdoctoral researcher at UC Santa Cruz, the study focused on massive galaxies for which the mass of the central black hole had been measured in previous studies by analyzing the motions of stars near the center of the galaxy. To determine the star formation histories of the galaxies, Martín-Navarro analyzed detailed spectra of their light obtained by the Hobby-Eberly Telescope Massive Galaxy Survey. Spectroscopy enables astronomers to separate and measure the different wavelengths of light from an object. Martín-Navarro used computational techniques to analyze the spectrum of each galaxy and recover its star formation history by finding the best combination of stellar populations to fit the spectroscopic data. "It tells you how much light is coming from stellar populations of different ages," he said. When he compared the star formation histories of galaxies with black holes of different masses, he found striking differences. These differences only correlated with black hole mass and not with galactic morphology, size, or other properties. "For galaxies with the same mass of stars but different black hole mass in the center, those galaxies with bigger black holes were quenched earlier and faster than those with smaller black holes. So star formation lasted longer in those galaxies with smaller central black holes," Martín-Navarro said. Other researchers have looked for correlations between star formation and the luminosity of active galactic nuclei, without success. Martín-Navarro said that may be because the time scales are so different, with star formation occurring over hundreds of millions of years, while outbursts from active galactic nuclei occur over shorter periods of time. A supermassive black hole is only luminous when it is actively gobbling up matter from its host galaxy's inner regions. 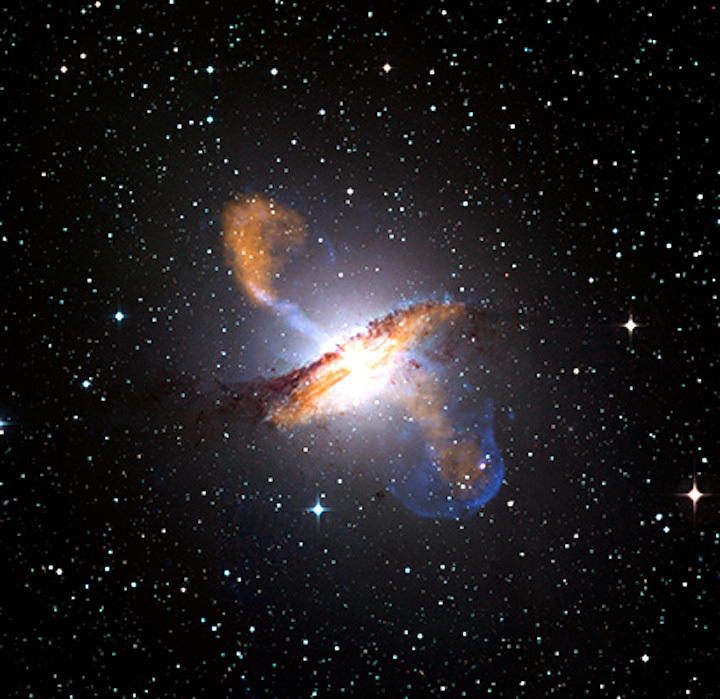 Active galactic nuclei are highly variable and their properties depend on the size of the black hole, the rate of accretion of new material falling onto the black hole, and other factors. "We used black hole mass as a proxy for the energy put into the galaxy by the AGN, because accretion onto more massive black holes leads to more energetic feedback from active galactic nuclei, which would quench star formation faster," Martín-Navarro explained. The precise nature of the feedback from the black hole that quenches star formation remains uncertain, according to coauthor Aaron Romanowsky, an astronomer at San Jose State University and UC Observatories. "There are different ways a black hole can put energy out into the galaxy, and theorists have all kinds of ideas about how quenching happens, but there's more work to be done to fit these new observations into the models," Romanowsky said. In addition to Martín-Navarro, Brodie, and Romanowsky, the coauthors of the paper include Tomás Ruiz Lara at the Institute of Astrophysics of the Canary Islands in Tenerife, Spain, and Glenn van de Ven at UC Observatories and the European Southern Observatory. This research was funded by the U.S. National Science Foundation, the Spanish Ministry of Economy and Competitiveness, and the European Union Horizon 2020 research and innovation program.